In order to accept online payments through 2Checkout for the documents you issue, you should first have a 2Checkout account. In case you want to create a new account, you may visit www.2checkout.com and follow the registration instructions from there. 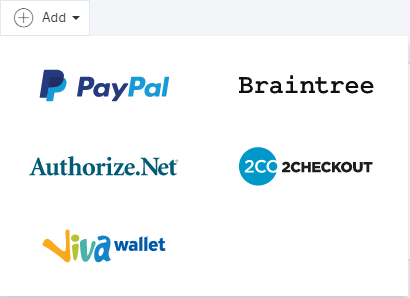 Note: If you have multi-currency transactions, make sure that 2Checkout supports the currency you're looking for. If you have transactions in foreign currencies, 2Checkout will automatically convert the money into your currency and deposit the amount to your account. As long as you have a 2Checkout account, its integration with Elorus is very simple. From the application's main menu, select "Settings -> General -> Payment Gateways." Click the "Add" button and from the available options choose 2Checkout. In the form of creating the new payment gateway, you'll first need to fill in the title. The title will be visible to your customers when paying a document online. Make sure that the gateway is active and if you want it to be automatically assigned to each new document, enable the "default" field. the Account number: You can find out your Account Number in your 2checkout.com account, under your vendor area. the Publishable Key: You can find out your publishable key in your 2checkout.com account, under the API tab. the Private key: You can find out your private key in your 2checkout.com account, under the API tab. You have now connected your Elorus account with 2Checkout and you can accept online card payments automatically! If you want to learn more about what the payment gateways are and the online payment process you can refer to the relevant article.